I’ve to admit that this day was a very hectic day. Within a single day, I had gone to three different places, and all require some physical activities, in sticky weather. And my failure to adjust to Malaysian standard time really added my burden. I was really drained by the time we arrived back at KL Sentral, and I was initially keen to return back to hotel to have shower before heading to Putrajaya. But at that time, it was already sunset. It was a difficult choice. But I was determined to fulfill my promise to bang Mokhzani. 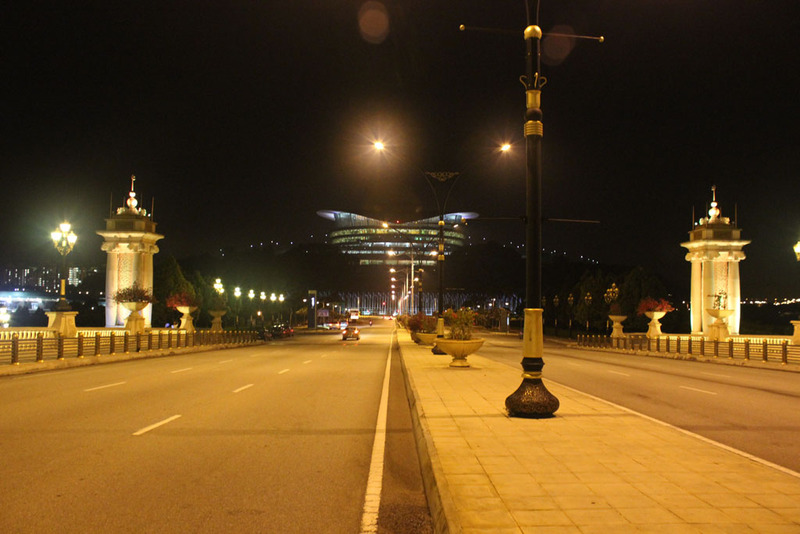 And besides that, I want to see Putrajaya by myself. I haven’t been there before, and back in 2004 I was unfortunate enough. But this is it! This is the chance. So I decided to forsake my tiredness and proceed to Putrajaya. My brother was too tired to join and decided to return back to the hotel. Kelvin accompanied my brother, before returning back home too. 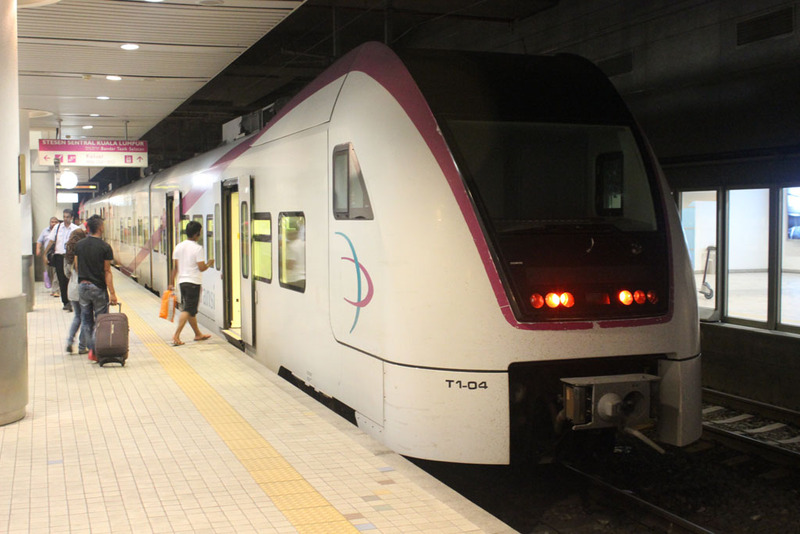 I went to the ERL ticket counter where I purchased the KLIA Transit ticket. Upon coming down to the platform, I was quite surprised that the platform looks busy. 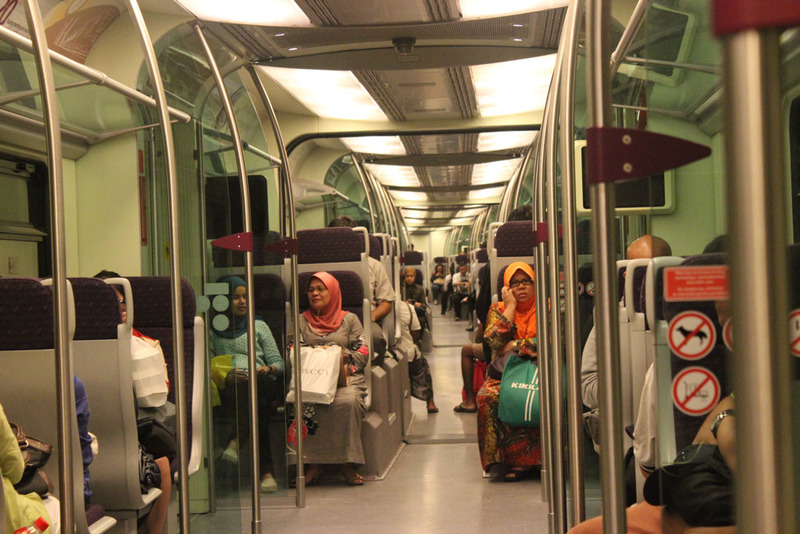 Apparently, this train also doubled as commuter train for those who lived in Putrajaya. That’s quite interesting, considering that the ticket price is higher than KTM Komuter service (of the same distance). Not long afterward, the train finally arrived. 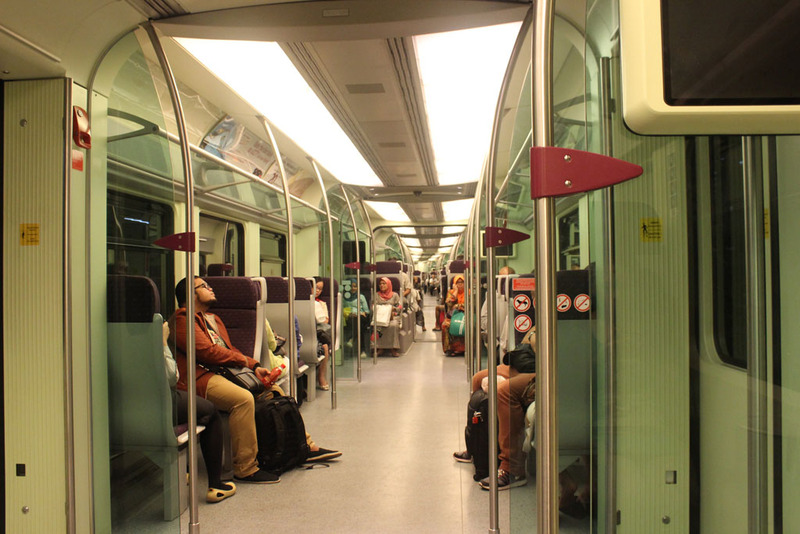 Since it was afterhour, the train was filled with commuters who want to return back to Putrajaya. Upon arriving at Putrajaya Sentral, bang Mokhzani greeted me. Back when we met in Singapore, he offered to took me around Putrajaya, which I gladly accepted. 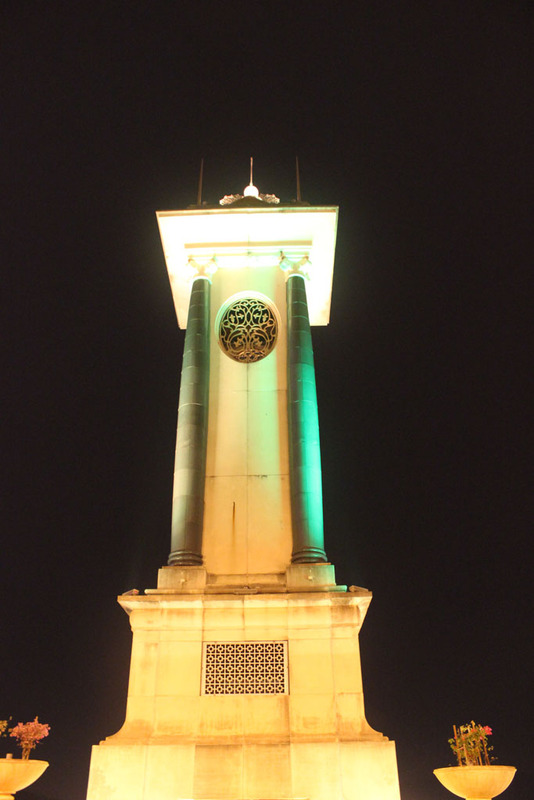 First, he took me to one riverfront where I was greeted by the sight of this spectacular Mosque. 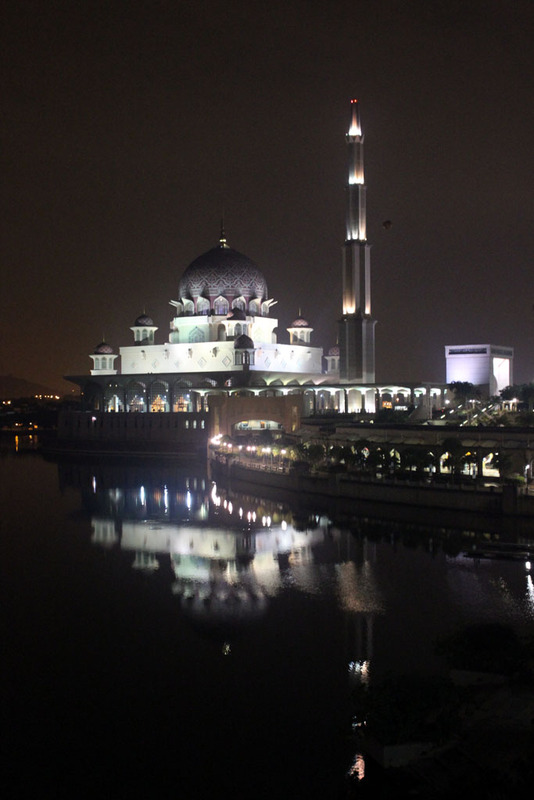 It is called Masjid Besi or Iron Mosque, possibly due to its steel construction. 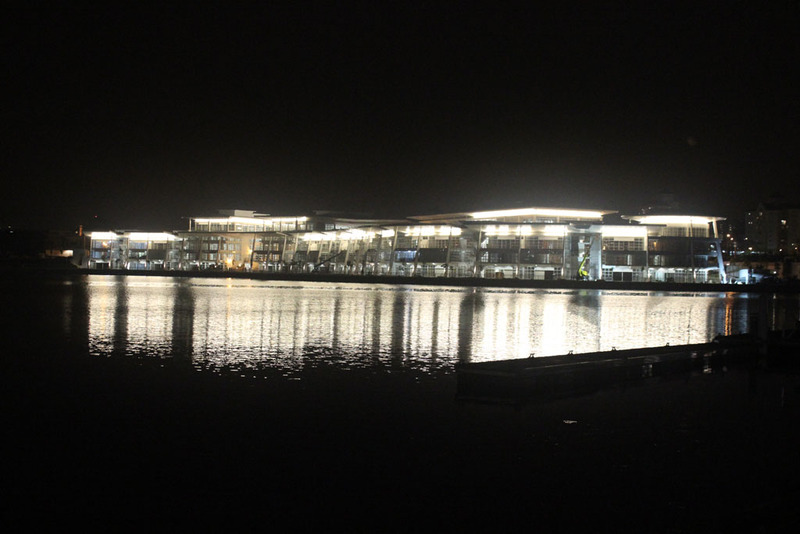 On the other side of the river, there is one newly opened shopping center. 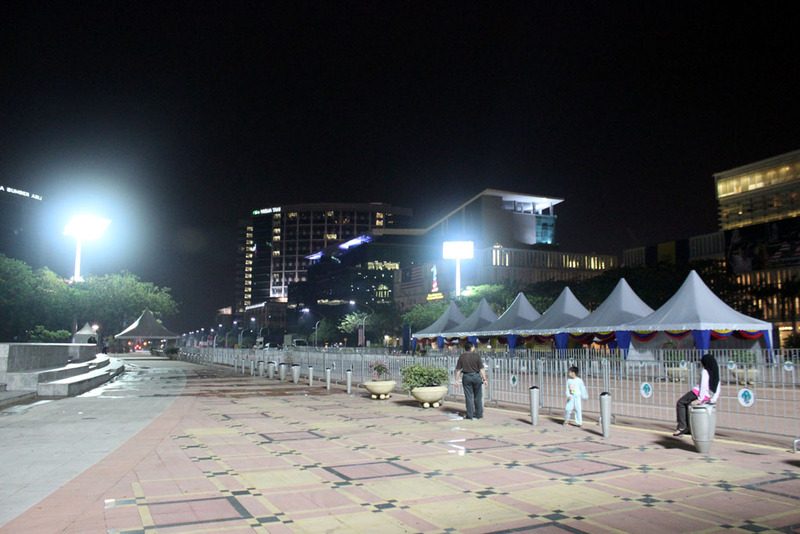 Bang Mohkzani said that it is the first (and so far only) large shopping center in Putrajaya. He also invited me for a dinner in one restaurant nearby. I ordered an unique fried rice. 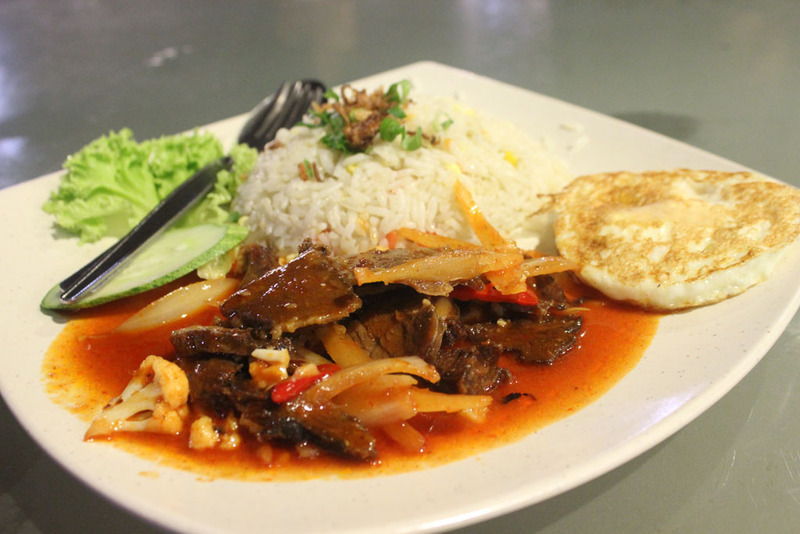 It is called “Nasi Goreng USA”. 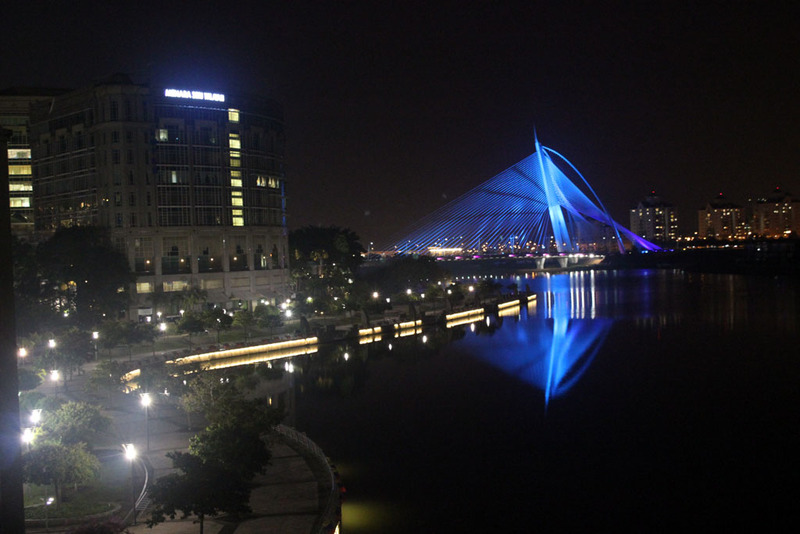 After we finished the meal, bang Mokhzani took me to one of the bridges in Putrajaya. I was really amazed by its changing colors. 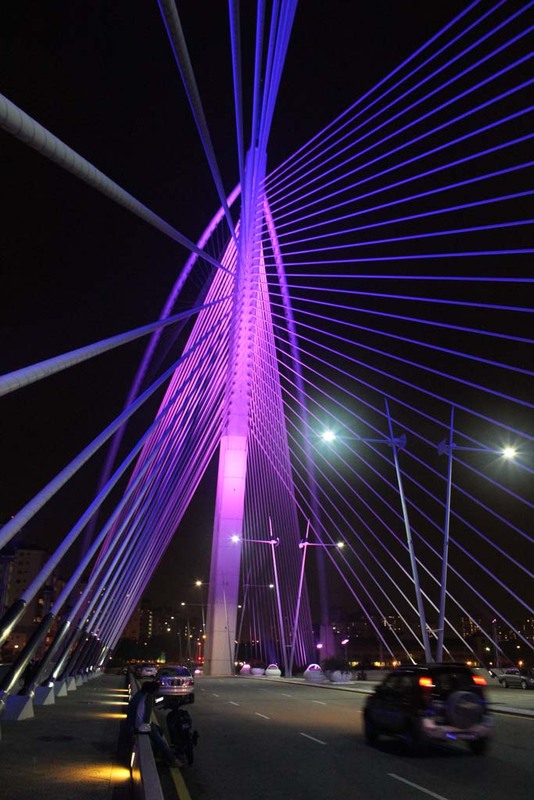 A combination of futuristic design and changing colors really made this bridge looks spectacular at night. Bang Mokhzani said there are three of them. One of them is the abandoned monorail bridge. He was right. From the bridge, I could see its twin sister, as well as the Iron Mosque. The dark bridge in the middle is the uncompleted monorail bridge. 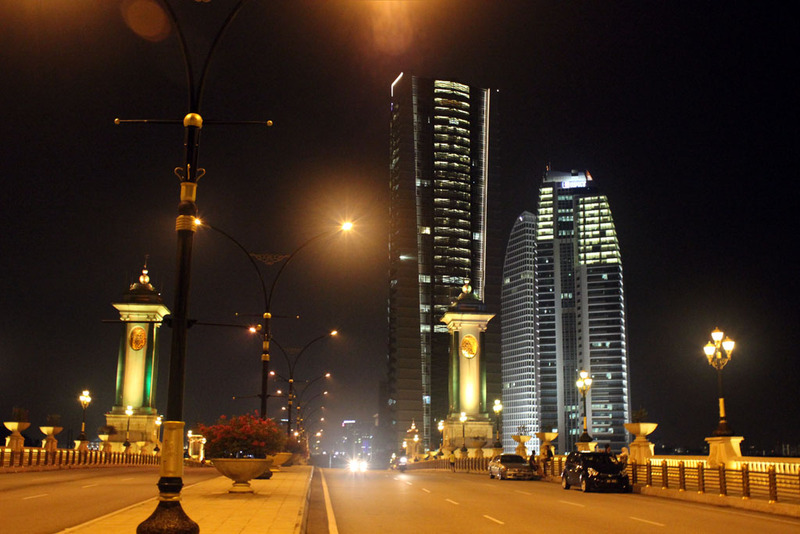 Putrajaya, in my opinion, is a premium city. 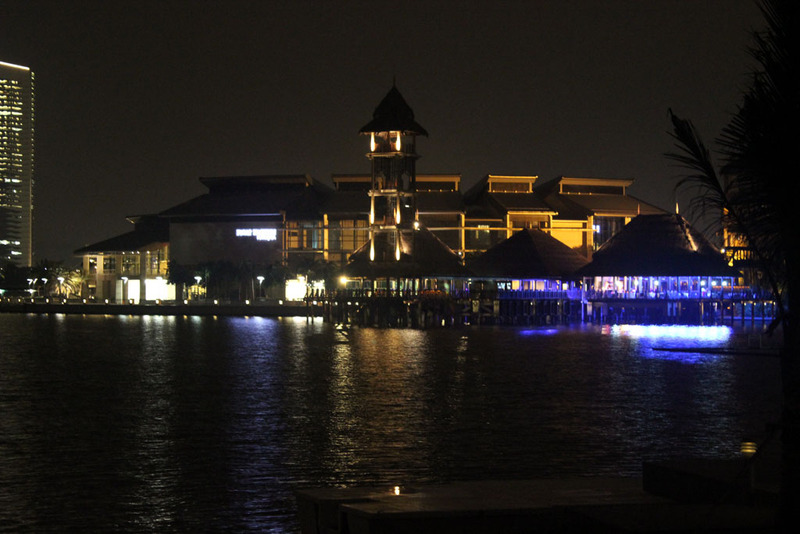 It is an expensive city by Malaysian standard. 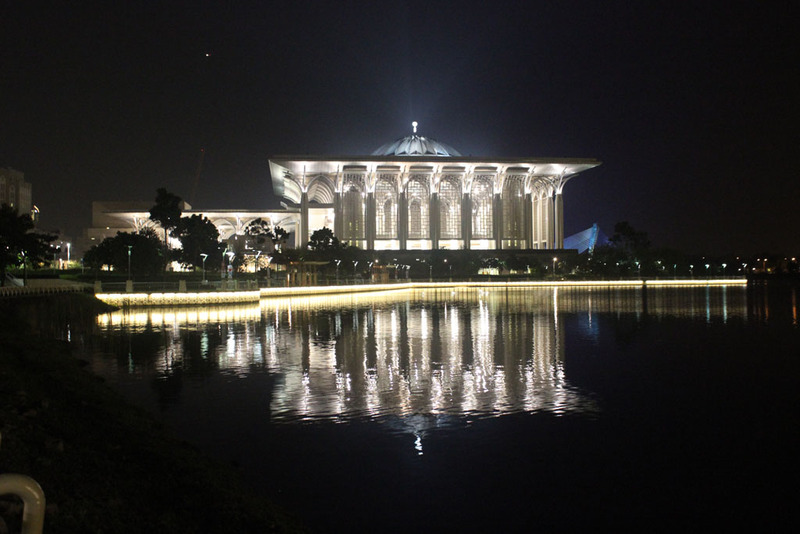 Anyone who doesn’t work as government employee may find living cost in Putrajaya as expensive, but those who lucky enough to work in government office at Putrajaya would feel like in heaven. They work in relaxed atmosphere of government office, and live in subsidized luxury houses. 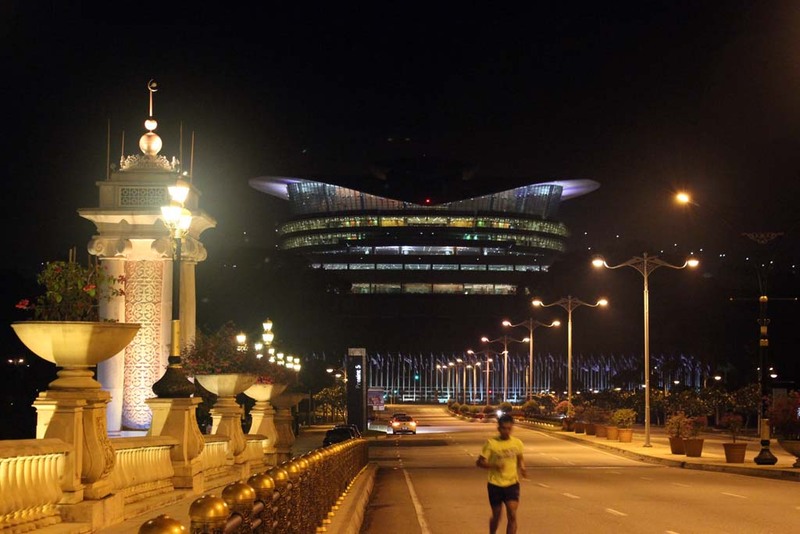 Putrajaya also have a much better city management when compared to Kuala Lumpur, down to its water and waste management. 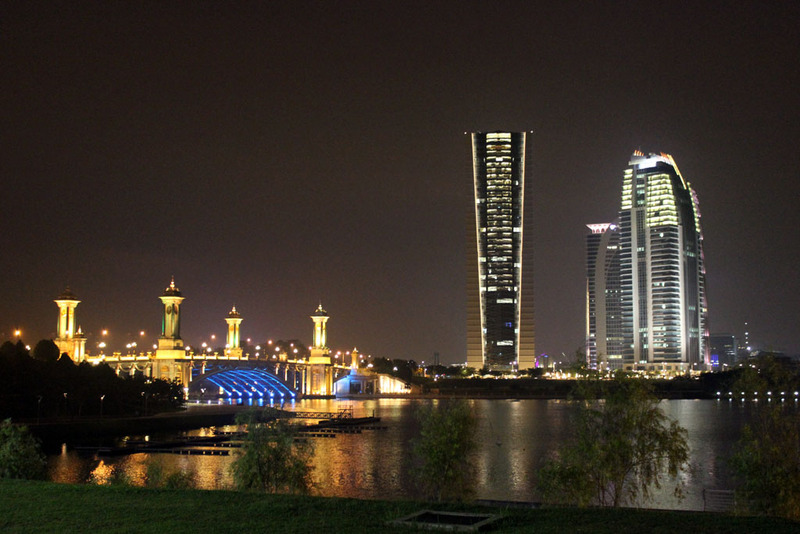 Despite the presence of skyscrapers in Putrajaya, there is no commercial district in Putrajaya. 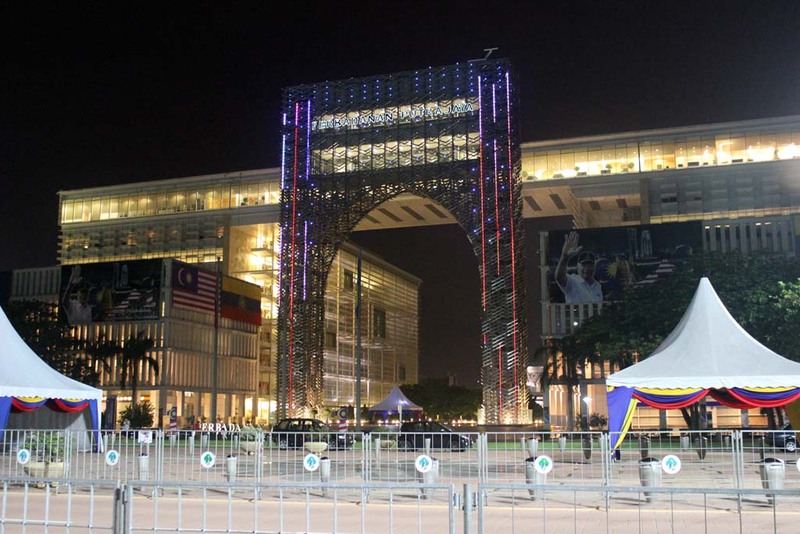 All corporate offices, including government owned companies, are based in Kuala Lumpur, leaving Putrajaya solely as Central government center. 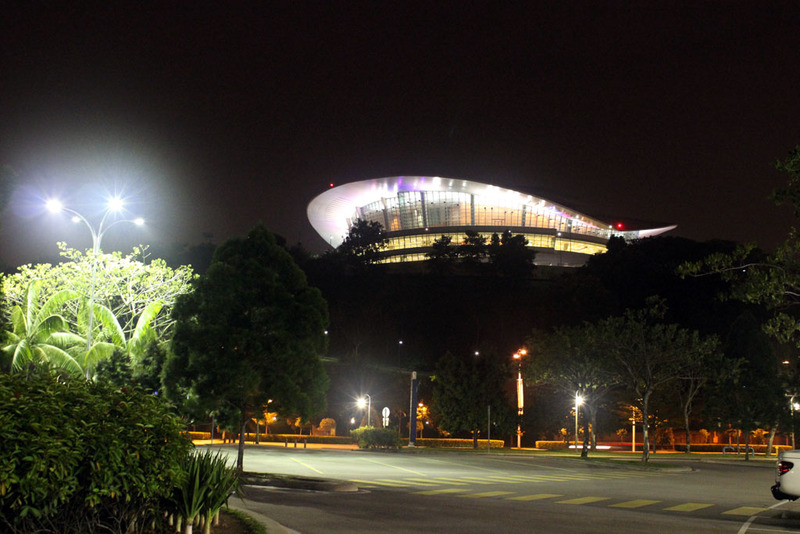 The Malaysian government, in my opinion, might have enough money to burn, as they were willing and able to build such a large, modern, and spectacular city…..and it is solely for government use. At first glance, this might look like a busy commercial center. But in reality, it is all government buildings. They’re closed at the time when I took the photo because the employees have gone home for the day, and would only re-open on the following day. 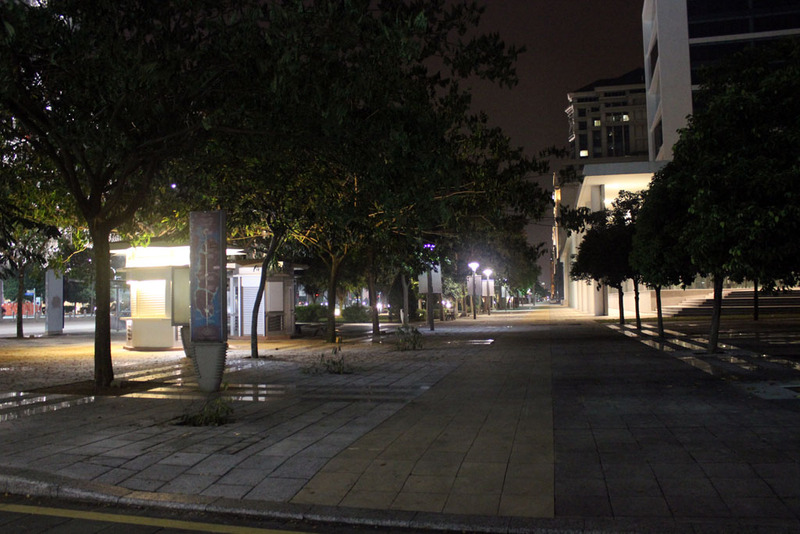 I believe, during the major public holiday, especially Eidul Fitri holiday eve, the city would become a “hollow city”, a city that looks magnificent, but inside it there is nothing or no one. 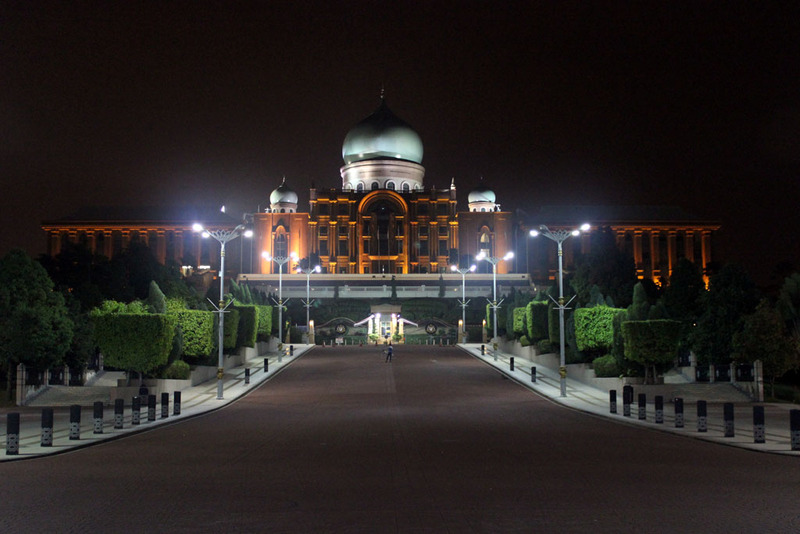 Even the parliament building is still remained in Kuala Lumpur. The embassies also followed the suit as relocating to Putrajaya (and accessing Putrajaya for their citizens) is rather expensive. Bang Mokhzani took me to one of the bridge, which has these Persian-style buildings. 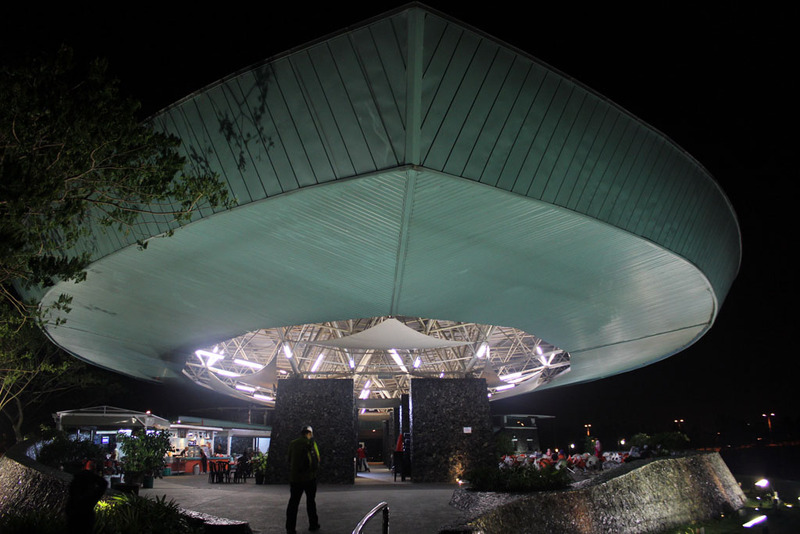 I don’t know what the function of this structure is, but it looks very nice. From this bridge, I can see the very first Grand Mosque of Putrajaya. Since it was already late at night, it was already closed. 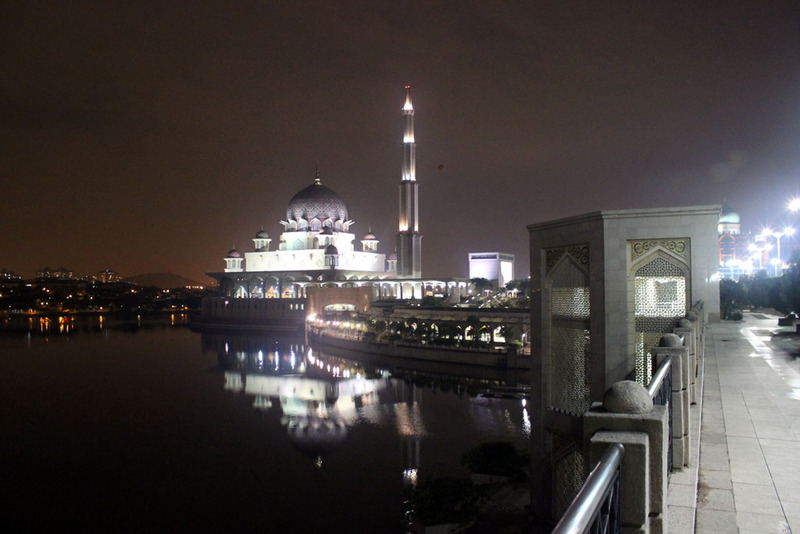 But I do hope that one day I must pay visit to one of Putrajaya’s mosque to pray. Bang Mokhzani took me to one unique looking building. 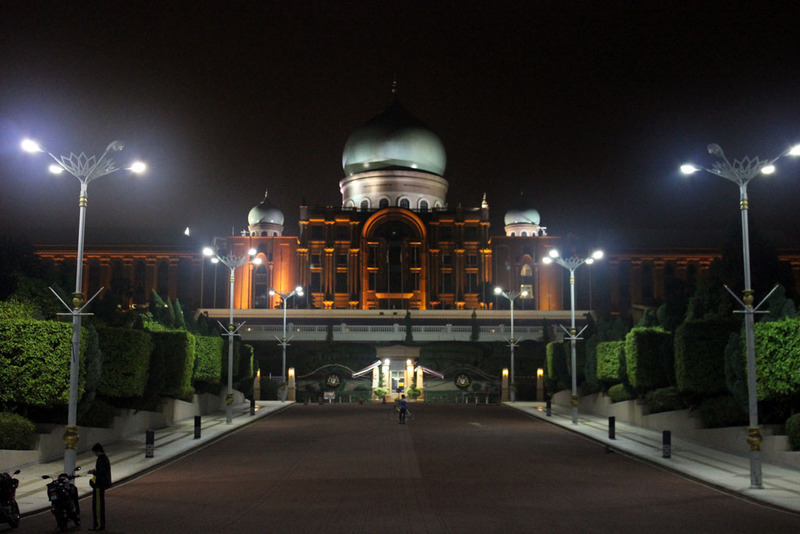 This Moorish-looking building is the office of the most powerful person in Malaysia: Malaysian Prime Minister. 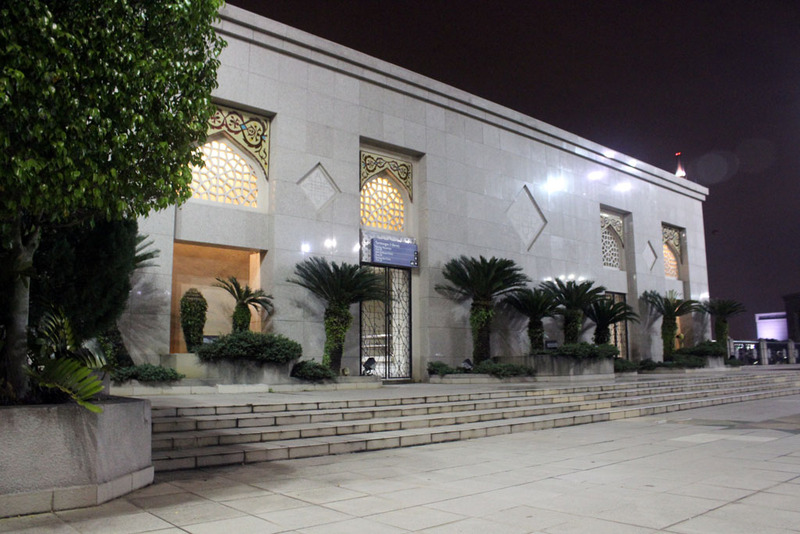 Despite of its importance, the building looks empty and deserted. There seemed to be no guard visible, presumably posted in one hidden place around there. From there we go around Putrajaya with bang Mokhzani;s car. Along the way he showed me the uncompleted monorail structures. 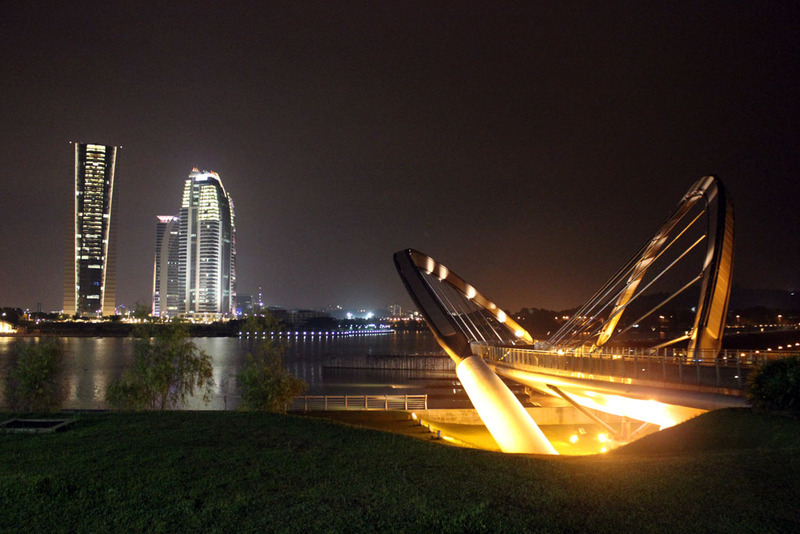 It was initially built as a mean of public transport for the citizens of Putrajaya. 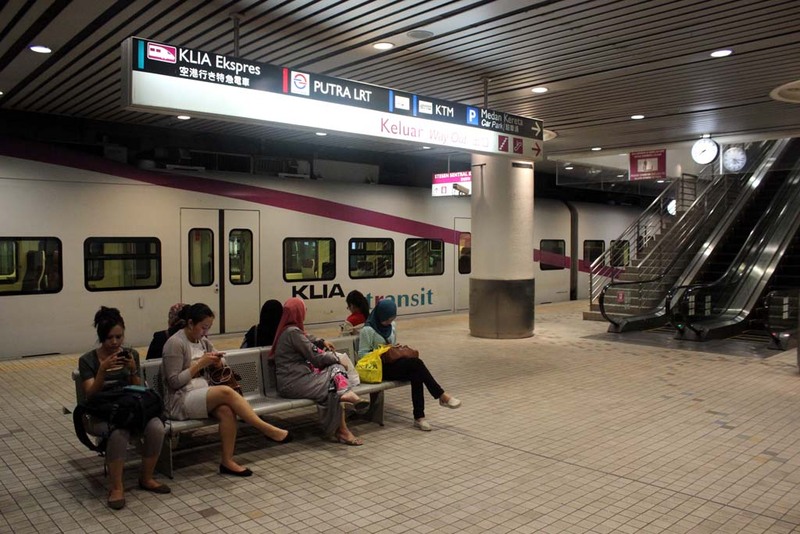 But due to the expensive price, combined with low population, made the monorail unfeasible, so the project was stopped midway, leaving truncated monorail structures scattered around Putrajaya. Including this would be underground monorail station which is now used for something else. That leaves bus as the only mean of public transport in Putrajaya. But that too seemed to be rarely packed, as most of Putrajaya resident would prefer to travel by private vehicles such as car. 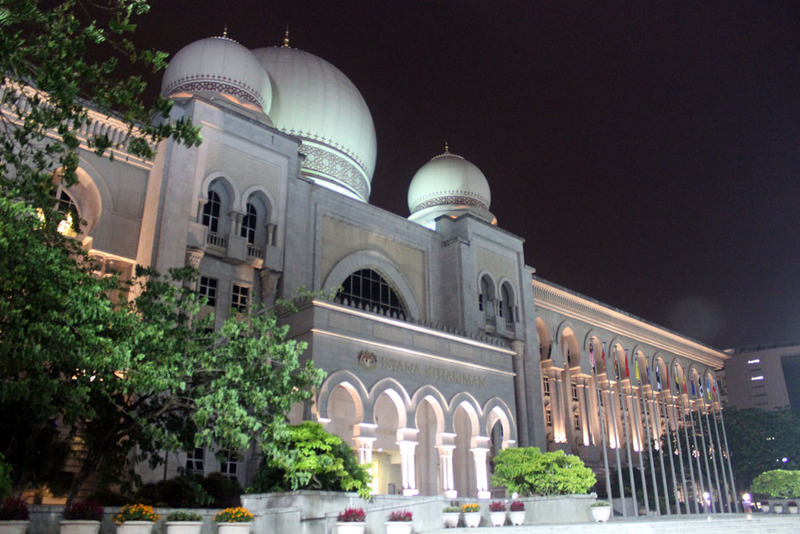 It seemed that most of the important buildings in Putrajaya have Moorish architecture, such as this Palace of Justice. The main road in front of it is fenced, and there are tents set up. I don’t know what kind of event being held there? The adjacent building does have an impressive looking style. Although the lights are on, I could clearly see that no one is inside. Next stop is this bridge. 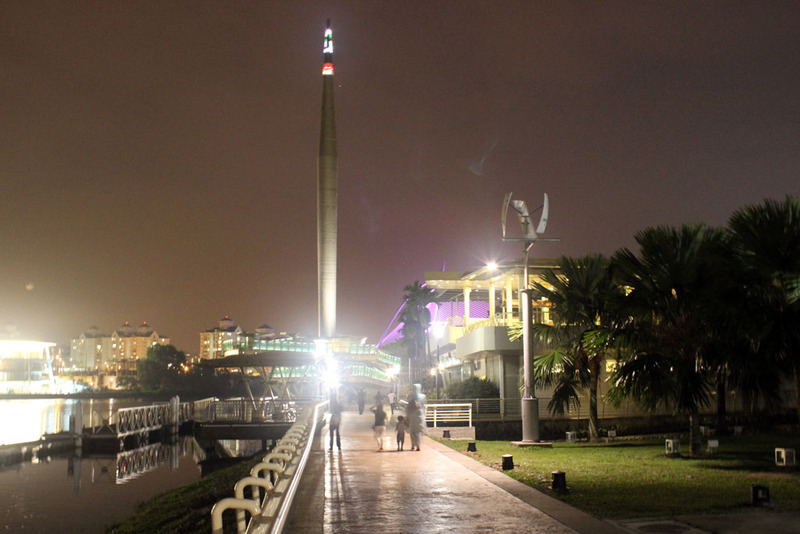 It is called “Seri Gemilang” bridge. From this bridge you could see the Convention Center that looks like a space ship. If you turned back you could see Putrajaya’s skyscraper. Impressive yes, modern yes, but it is also empty. So you could see that Putrajaya is a perfectly planned city. Bang Mokhzani then took me to one parking lot near Convention Center. He didn’t took me to that building. 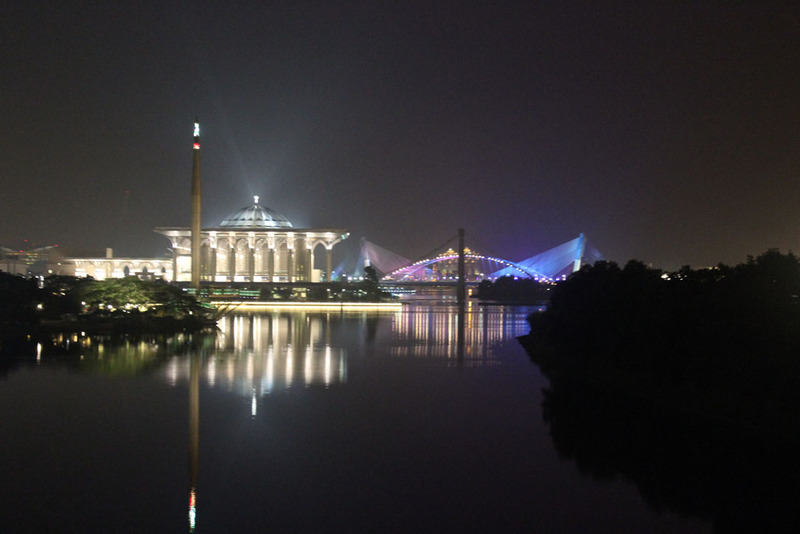 But instead, he took me to the best vantage point of Putrajaya. From this place you could see Putrajaya Lake with the backdrop of Putrajaya’s skyscraper. If that’s not enough the nearby food court has an out-of-this-world architectural style. Even the lake’s dam has a futuristic design too. 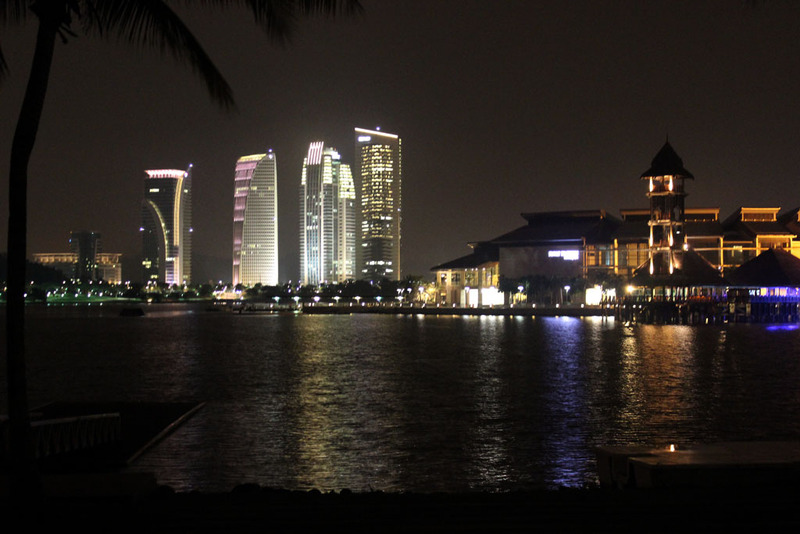 From that place, bang Mokhzani took me to the place where we could see one of the hotels in Putrajaya. This view (complete with the coconut trees) gave the impression as if we’re in Miami or something. I forgot what is this hotel’s name but it is a very expensive hotel. 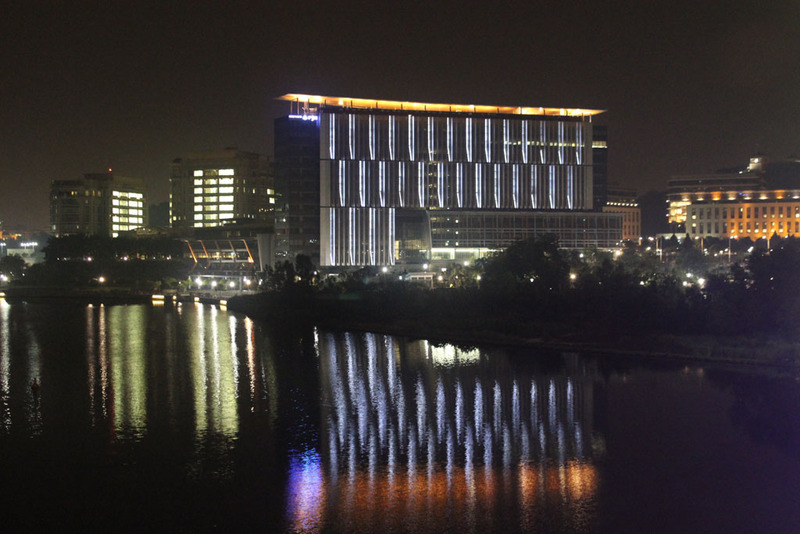 Indeed, cheap lodging is non-existent in Putrajaya. All hotels are designed for foreign dignitaries or well-to-be people. Even if it means that the hotels are mostly empty. Bang Mokhzani then took me around Putrajaya, but I already felt too tired to take photos. I felt very thankful for bang Mokhzani’s effort to take me around Putrajaya. I consider the trip worthwhile. Still, I am still considering to revisit the place as very few of my photos are perfect. He then took me to Putrajaya Sentral where I bade farewell and took the train back to my hotel, although this time I debarked at Bandar Tasik Selatan, where I was lucky enough to be able to catch the last train to Maluri.